I am very pleased that author and food historian, Linda Civitello, will be contributing to the website from time to time. We have put our heads together, lining up topics and recipes drawn from history that resonate with how we want to bake and cook today. We are launching this collaborative series with the hottest and newest bakery and restaurant trend – TOAST! But wait…is it the hottest and the newest? 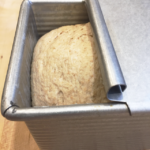 Linda gives us a little historical perspective including some of the recipes that started it all, and my contribution at the end will give you the vehicle for judging whether or not they have stood the test of time: a recipe for whole grain pain de mie. James Bond had a dilemma: “The trouble always is not how to get enough caviar, but how to get enough toast with it.” Who among us cannot sympathize with this poor man? And in his very first book, too—Casino Royale, in 1953. This just shows how ferocious about toast the British are. Nineteenth century cookbook writers agonized over toast and created toast anxiety in readers: How old should the bread be? How wide the slice? Crust? No crust? Are you just browning the outside, or drying it all the way through? What to put on it? Ham with veal gravy? A poached egg with curry cream sauce? Green herb sauce? Oysters and bacon? Mushrooms? Buttered shrimp? Do you want Bombay Toast? Madras Anchovy Toast? This was the breakfast of empire. For cinnamon toast, we also have to go back centuries, to the people who gave the world pizza, pasta, and gelato—the Italians. Specifically, Neapolitans. 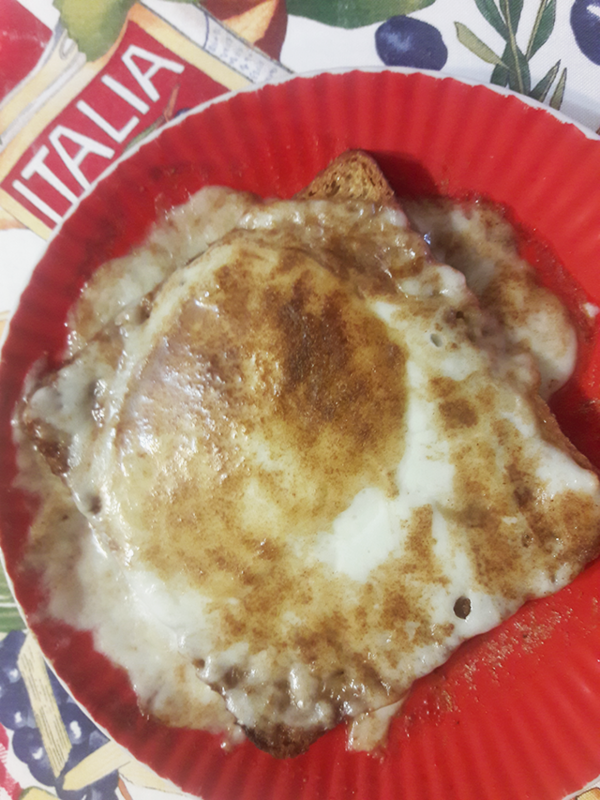 And there it is, in the 1400s in the Cuoco Napoletano—The Neapolitan Cook—a recipe for Cinnamon Toast. And grilled cheese. At the same time. A winning combo for more than half a millennium. The modern version, which we tested and tasted and ate all of, is to take some bread—see Grist & Toll’s recipe for Pan de Mie, below—and don’t cut off the crusts, because believe me, you want every crumb of this bread, and it doesn’t really have a crust anyway. Then toast it, butter it, and sprinkle it with cinnamon sugar. One tablespoon sugar mixed with1/2 teaspoon cinnamon is a good ratio. 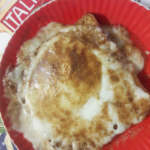 Top it with slices of fresh mozzarella, and sprinkle it with more cinnamon sugar. Don’t cheat. I know you—you think you’ll save time by sprinkling on the sugar and the cinnamon separately. All that does is guarantee that you’ll get a nasty mouthful of straight cinnamon somewhere down the line. Mix the cinnamon and sugar together. If you don’t use it all for this, you’ll use it for something else—coffee, cereal, whatever. Then microwave the toast, covered, for about 40 seconds. Uncover and microwave for another 20 seconds until bubbly. We used 100% power but microwaves might vary. Wait a minute before you cut into it or you’ll burn the roof of your mouth. OK, mom. By the 19th century, toast and cheese sauce was a serious thing, especially as a late-night or after-theater snack. Make the sauce with ale and cheddar, and it’s Welsh Rarebit. Use white wine and Gruyère, call it fondue. Here we have some historic recipes and modern recipes for you, using a variety of techniques and ingredients. But all of them work really well with our Pain de Mie. Select richest and best American cheese, the milder the better, as melting brings out strength. To make 5 rarebits, take 1 pound cheese, grate and put in tin or porcelain-lined saucepan; add ale (old is best) enough to thin the cheese sufficiently, say about a wineglass-ful to each rarebit. Place over fire, stir until it is melted. Have slice of toast ready for each rarebit (crusts trimmed); put a slice on each plate, and pour cheese enough over each piece to cover it. Serve while hot. 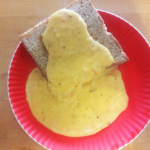 This recipe, which we have not tested, seems fairly bland, with its instruction to use mild cheese, and without the seasonings of Worcestershire Sauce, cayenne, and dry mustard we associate with Welsh Rarebit now. It is just cheese diluted with alcohol. Toast with those seasonings was called Croûtes en Diable—Deviled Toast—which was “useful to stimulate the action of the stomach.” Other riffs on Rarebit include Golden Buck–a poached egg on top; and Yorkshire Rarebit—bacon on top of the egg on top of Golden Buck. Here’s our more modern version of all of these, spiced and made with American hard cider. This combination of bacon, cheese, apples, and this particular toast is serendipitous. Be careful adding salt. The amount you need will vary depending on what kind of cheese you use and how salty the bacon is. Cook the bacon in a frying pan. When it is done, set it aside. Add the flour, mustard, and salt to the pan the bacon cooked in. Stir for a couple of minutes to combine and cook the flour. Add the cider. Stir to combine. In a couple of minutes, it will bubble up and thicken. Add the cheese. Stir until the cheese is melted. In the same pan, fry the eggs. Put them on top of the cheese sauce and toast. Serve with the bacon. This British-style cheese and toast is sort of an open-face grilled cheese. And what do Americans love with grilled cheese? Tomato soup. Enter an old New England concoction, Rinktum Ditty aka Rinktum Diddy, which deconstructs the grilled cheese sandwich with a side of tomato soup, and puts everything back together as a sauce. This 1910 recipe is from the Woman’s Cook Book, New Market, New Hampshire. Melt butter size of an egg, add one cup tomato, pulp and juice, and 1/4 teaspoon [baking] soda; when this simmers add 1 cup milk and cream mixed, and 1 pound cheese cut in crumbs; when cheese is melted add 10 drops tabasco sauce, cayenne and salt to taste; add 3 eggs slightly beaten with a fork; cook until thick. Serve on Uneeda biscuits. During World War I, wheat production increased to feed the troops. Problem: it did not go back down after the war. 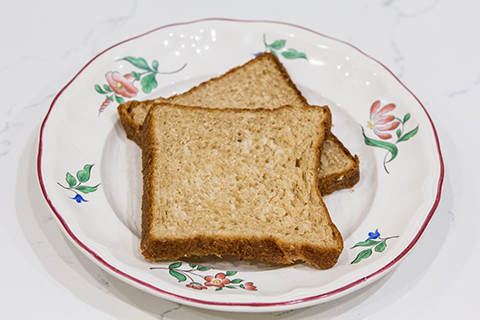 With a surplus, American farmers began the “Eat More Wheat!” campaign, followed by “Eat More Toast!” With electricity reaching American kitchens in the 1920s, the tabletop toaster became a common appliance, along with sliced bread. It took a lot of coordinating and engineering to get the slice to fit exactly in the toaster. You didn’t really think that was just a lucky coincidence, did you? In the 1920s during Prohibition in the United States, with the alcohol removed, you couldn’t call it Welsh Rarebit any more. 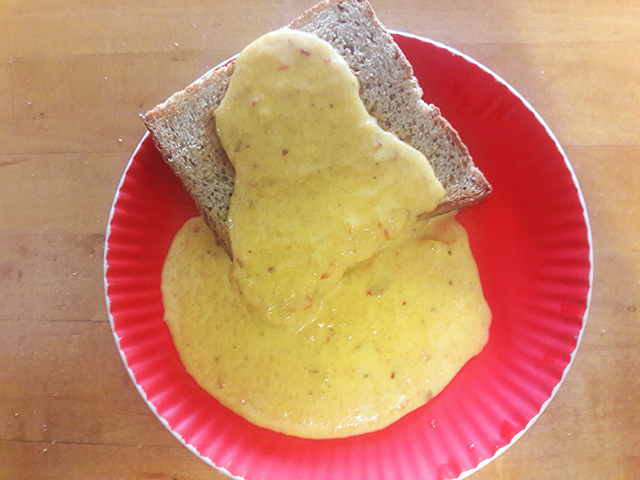 Enter “Cheese Toast,” no alcohol but a roux base and the rarebit seasonings. Here’s a recipe from a 1920s Armour cookbook, 36 Ways to Serve Bacon. Ignore the brand names. Preparation, 15 minutes. Serves six. Fry one-half pound of Armour’s Fixed Flavor Star Bacon until delicately browned. Make a sauce of four tablespoons Fixed Flavor Star Bacon drippings, four tablespoons flour, and two cups milk. Season with 1/2 teaspoon salt, 1/2 teaspoon paprika (1/2 teaspoon Worcestershire Sauce if desired), and stir in 2/3 cup of Cloverbloom Cheese grated. Cook about two minutes or until the cheese is melted. Pour over six slices of toast and place two or three slices of bacon on each slice of toast. This next recipe is our very streamlined microwave version of Welsh Rarebit, with alcohol. No need to add spices because the cheese is already loaded with chili peppers. Again, be careful with the salt. Melt the cheese and butter in the microwave. Out of the microwave, add the ale, sale, and optional mustard. Stir to combine everything. If it’s lumpy, pop it back in the microwave for 20 or 30 seconds, then stir again. Whatever you call these combinations of toast and cheese, they are addictive. If you want 7 minutes of amusement, take a look at Dream of a Rarebit Fiend (1906). This silent movie with music, sound effects, and very early special effects is about a glutton who chows down on so much Welsh Rarebit that he hallucinates. It doesn’t help that he is also drunk. Whole lotta reelin’ goin’ on. Best part: what comes out of the chafing dish in the dream. This was directed by Edwin S. Porter, who also directed the first American movie that told a story, The Great Train Robbery, in 1903. https://www.youtube.com/watch?v=s39jimMyAFI Not to be confused with Dreams of a Rarebit Fiend (1921) an 11-minute long animated movie with no rarebit, just a scary dream. Hand-drawn by Winsor McCay, who invented Gertie the Dinosaur. This recipe is inspired by Julia Child and Sarah Owens, which is the perfect nod to both tradition and a newer approach. I settled on a commercial yeast recipe, wanting to highlight a delicious and special bread that can be easily baked and eaten in the same day. If you are looking for an excellent sourdough pain de mie, I can’t recommend enough the version in Sarah Owens’ new book “Toast and Jam”. I have already made it several times and it has become a standard member of my baking repertoire. You don’t technically have to bake this bread in a traditional pain de mie loaf pan, but you won’t have those beautiful squared edges if you don’t. And here’s a helpful tip: if you want tall, domed quick breads without fail every time, bake them in your 8×4 pain de mie pan (without the lid of course!) instead of a regular loaf pan. I will never use the traditional 8×5 or 9×5 again. I settled on a combination of flours: Hard White and Einkorn. You should feel free to go your own way here: 100% Hard White, 100% Hard Red, 50/50 Hard White/Spelt, are several winning options, just be sure your total flour weight adds up to 370 grams. I have not tested this recipe using 100% softer wheat like Sonora or Einkorn. They are delicious options, but will most likely give you a tighter crumb and less oven spring due to much weaker gluten strength. As always, this recipe has been developed specifically for Grist & Toll stone milled, whole grain flour. Other brands will not yield the same results. Butter an 8×4 Pullman loaf pan and the underside of its lid. Set aside. Gently warm milk and honey, either in the microwave or on the stovetop in a small saucepan. Add yeast, stir to combine, and set aside to become active and foamy. Mix: In the bowl of a stand mixer fitted with the dough hook, put both flours, yogurt and butter. Add yeast mixture and mix on medium low (Speed 2) for 3-4 minutes. Cover bowl with a towel or plastic wrap – you don’t need to remove the hook, just wrap around it – and let rest for 20 minutes. Sprinkle salt over dough and mix again on Speed 2 for 4 minutes. Transfer dough to an oiled bowl, cover tightly with plastic wrap and let rise until doubled in bulk. Depending on ambient temperature and humidity this can take 1 ½ to 2 hours. Shape: Transfer dough to a lightly floured work surface and pat into a rectangle roughly the length of your bread pan. 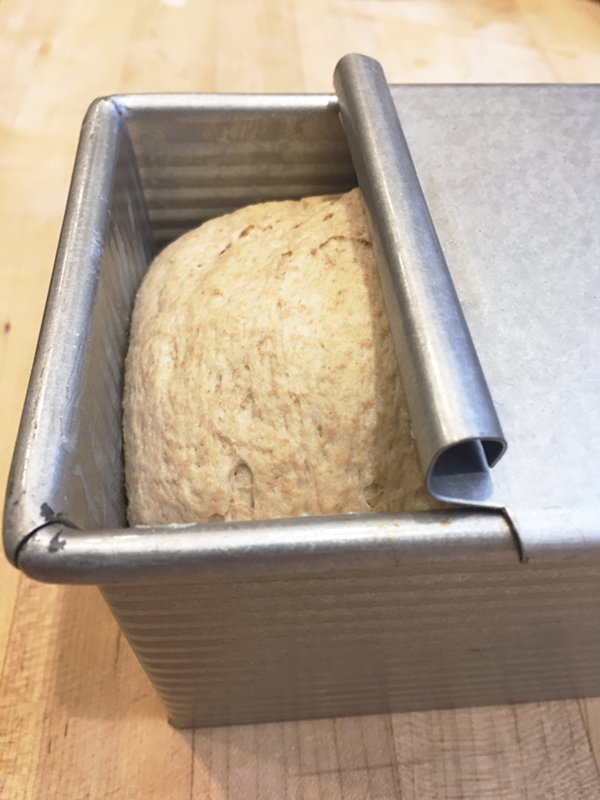 Roll up jellyroll style, pinch seam to close and place in prepared loaf pan seam side down. If using a pain de mie pan, slide the lid on to close. Otherwise, cover with a towel or plastic wrap and let proof just until the top of the dough almost reaches the top of the pan, about 45 minutes to 1 hour. Bake: place on middle rack in oven and bake for 35 minutes. Remove lid and check for doneness. If your bread temp is around 200˚, it is ready to come out. If not, continue baking for another 5-10 minutes. Remove loaf from pan and let cool completely before slicing.